FeelingStream was one of the winners at VUNK accelerator program 2015. They've been working on their solution focusing on helping large service companies improve their customer experience. CEO & founder Terje Ennomäe shares her lessons for the past year. Tell us about the inspiration for FeelingStream, from idea to realization? I have been working for customer service area more than 16 years. Therefore I know quite well about contact centre processes, internal quality management or customer experience management. A year ago, I was responsible for customer experience in Bigbank Group operating in 9 European countries and wondering why customers are calling or emailing to us. What kind of contacts we have in Lithuania or Sweden and how they are different from Spain? I desperately needed a technical solution which could categorize customer contacts precisely, fast and objectively. As I could not couldn’t find this kind of tool, I decided to create it by myself! How well is the world of customer service developed IT-wise? Heads of Customer Service believe that only 50% of the projects they oversee involve technology. CIOs and IT leaders believe it is closer to 80% (Gartner). I personally believe that technology can help to solve routine and back office tasks but all communication with customers should involve real people. Think about yourself - you have smooth experience with Travel Agency website, you enjoy the visual and functionalities. But then something weird happens with flight ticket payment and you have to fix it over phone. Sure you want to talk with a real person. What’s the difference between FeelingStreem and another great Estonian founded startup Sorry As A Service? We both are enthusiastic about good customer experience and want to help companies to solve unhappy customers feelings. But we have different focuses. 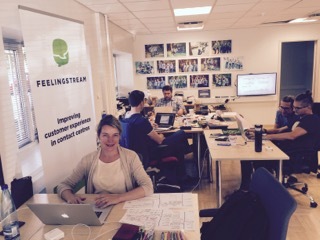 FeelingStream helps large companies to understand customer communication as feedback notes or incoming emails. We help to improve the service for all the customers. Sorry As a Service helps companies to win-back those customers who have experienced undesired service experience. If something has gone really wrong. I wish good luck to Sorry as A Service team! Sure. We do too! But, more about competition - are there other similar or seemingly similar solutions out there? Sure there are. We are not alone in this industry. But it happens mostly in English speaking world. We in FeelingStream focus on small languages (like Estonian or Finnish). In our region you cannot find this kind of solution. We work on to cover all languages in Scandinavia. But yes, the text analytics is mostly used in customer service. Try to imagine an airline company in US which gets around 8 000 customer feedback comments per day. These comments are analyzed by technology and business critical comments are forwarded to employee who takes care of the customer personally. Text analytics solutions are quite common also in legal or media sector. So far - what has been the most challenging period-problem you have had to face? And also, has there been anything you’ve been afraid of but turned out just fine? Well, there are challenges every day, we just solve them! I want to emphasize that we are still looking for a scalable business model and therefore experiencing currently the period with enormous amount of customer meetings. We call it customer research and only this way we can design our service to them. So how would you phrase the main goals for FeelingStream for the remaining 2016 / first half of 2017? We have only one goal - customer research! The only thing that is important - paying customer! And to get customer paying we need provide the service that has the value for them. What’s your advice for anybody who plans to take part in a hackathon? Something you didn’t think of yourself before it was too late? Can I compare this with sports? Hackathon is like pre-selection for Olympics games. You want to be in a strong team and therefore you have to give 110% of yourself. Take this 48 hours as your cheapest training with the biggest qualitative value. It's also valuable experiment. And never give up. There is always a solution - just you need to find it! What’s the most important skill-idea you took with you from the VUNK program? Openly discuss about my idea, ask feedback to my idea and listen the feedback. And the last one - what is your own main professional personal goal? I’ll work with my leadership skills and I want to run my company to make it more efficient and profitable so that both, our customers and our employees can get more out of their time.